named Isla de San Cristobal. 1635 Claimed for France (no settlement). 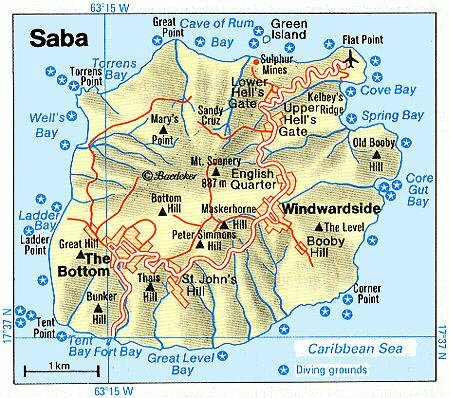 Apr 1640 Dutch colony (Saba); subordinated to St. Eustatius. 4 Jul 1672 - 1682 English occupation. 1682 - 1792 Dutch West India Company administration. 26 Nov 1781 - 1784 French occupation. 1801 - 1803 British occupation. islands of Dutch West Indies (not effected). 1810 - 1816 British occupation. 1919 - 1 Apr 1983 Saba subordinated to Sint Maarten. 1696 - 1698 Adriaan Runnels, Jr.
1810 - 1816 Edward Beaks, Sr.